Luke has been very busy in the last couple of months with lots of beautiful pieces on the go. The latest pieces to leave our Torquay workshop for their new home in the ‘big smoke’ of Melbourne is this matching pair of a Messmate dining table and entertainment unit custom made for the customers brand new home. Messmate is an Australian hardwood and member of the Eucalyptus family that is native to the cooler southern states. It is one of Lukes favorite timbers to work with as has lots of beautiful features such as sap lines, distinct grains and a variance of tones. The table is a large 8 seater with chunky solid wood exposed legs. This particular design creates a great deal of visual interest whilst maintaining a simplicity to ensure the piece will never go out of style. The space around the legs creates shadows and adds depth. The exposed part of the legs visible from the top shows off the end grain of the wood that tends to be darker due to absorbing more of the finish as well as having a different grain pattern. Some careful design and precise woodworking skill is required to ensure that the leg appears to be floating and not joined to the rest of the table. 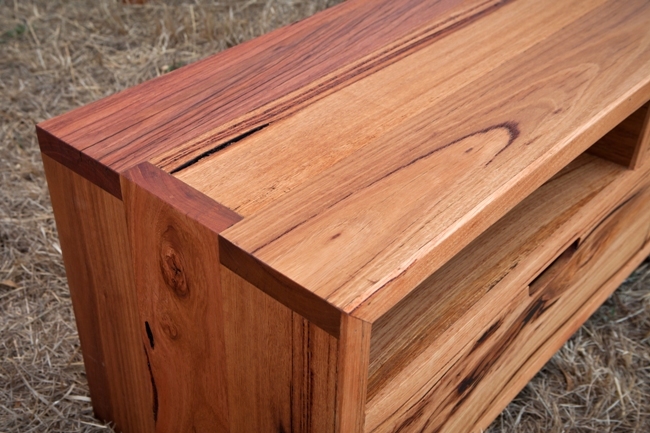 This modern and streamline TV stand lets the wood do the talking. The design is simple with the main features of the piece being some interesting joinery and the natural beauty of the wood. The timber was hand picked for this piece to be heavy in sap lines at one end and light at the other to draw the eye from one side to the other. This piece was custom designed and built to the clients size requirements so that it fitted perfectly into their space. 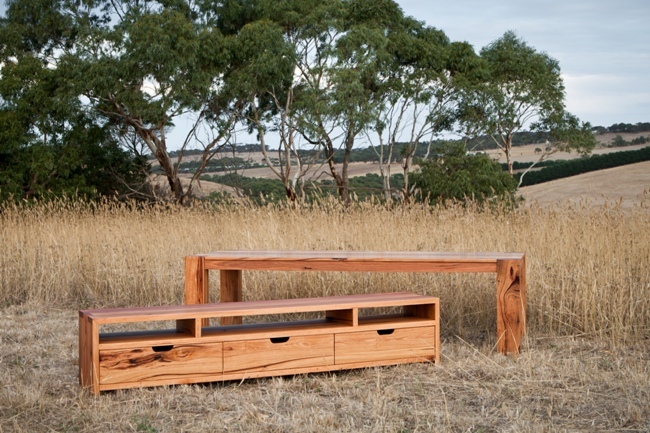 If you want more information on either the Bells Beach recycled timber dining table or TV stand, please contact us!